Sorta missed out on the whole National Hamburger Day thing this year (it was May 28th), but better late than never. We were recovering from our camping trip with some friends to Lake Whitney and to tell you the truth….I had been logged off of computers since the 24th (which was a great feeling.) But I can share some burgers that we made last week. 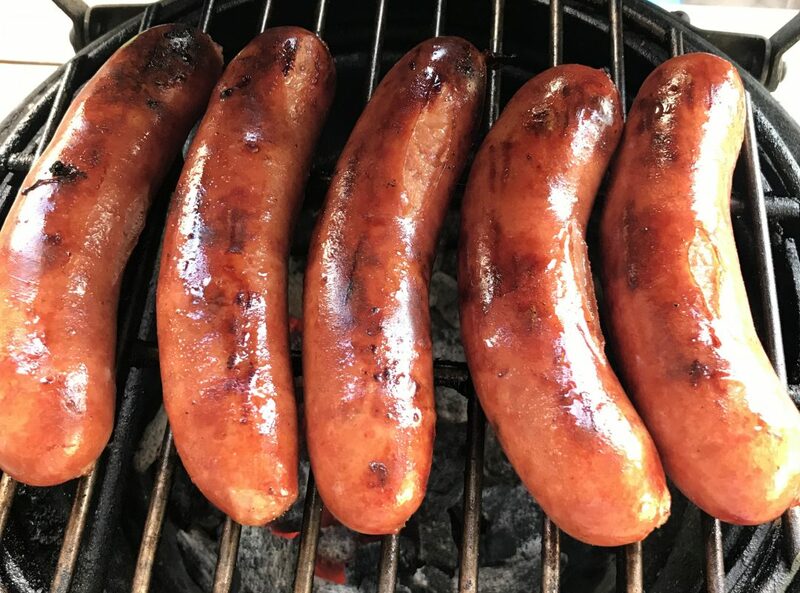 In all honesty, we made these ahead of time in order to post for National Hamburger Day, but we just got really busy getting ready for the camping trip and work and well….life in general. We started off using the last of our hamburger grind (guess its time to make some more) which was a blend of 3:1 chuck to short rib. A good tasty blend, but next time I think we’ll try to add in some brisket. 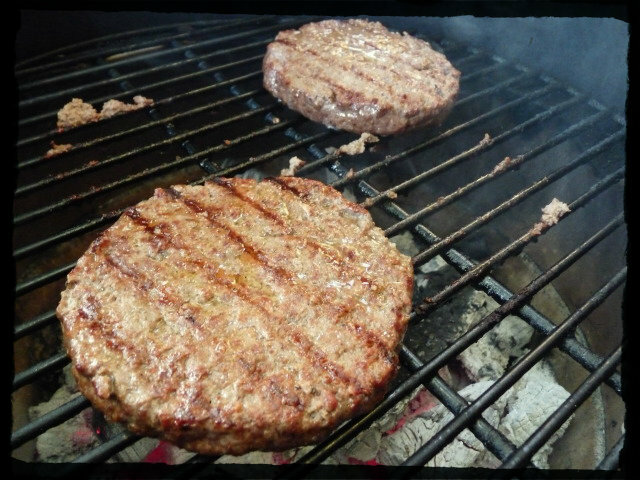 The wife made these patties big….half pound each BIG!! I know she added in some Stubb’s Burger Spice Rub, but I don’t know what else. Probably some worsey sauce, salt and pepper and I don’t know what else. These went onto the Egg which was pre-heated to 450F. After a few minutes, the patties got flipped. 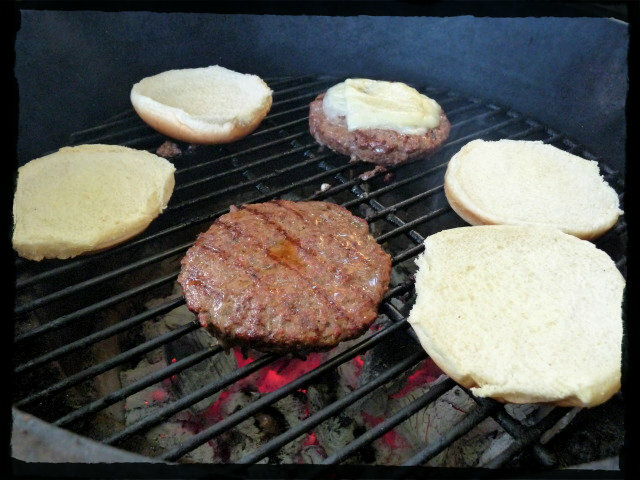 A couple more minutes, and we threw on the buns to get toasted and added Swiss cheese to Mrs. G’s burger. 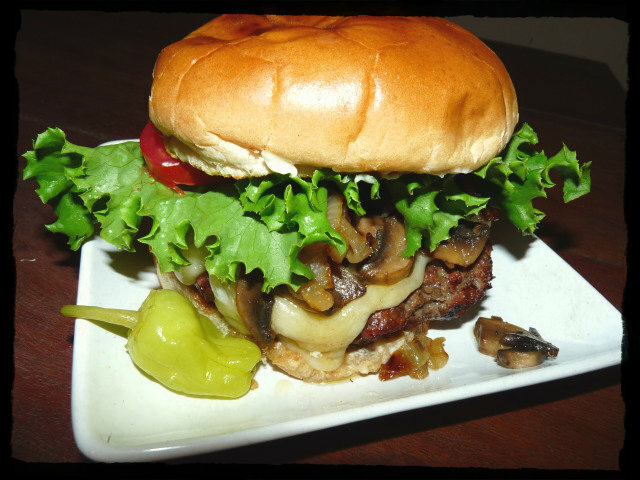 To make Mrs. G’s Mushroom Swiss Burger, we first added some sautéed mushrooms and then some onions that I had slowly cooked down earlier. Then she added some lettuce and tomatoes to top it off. 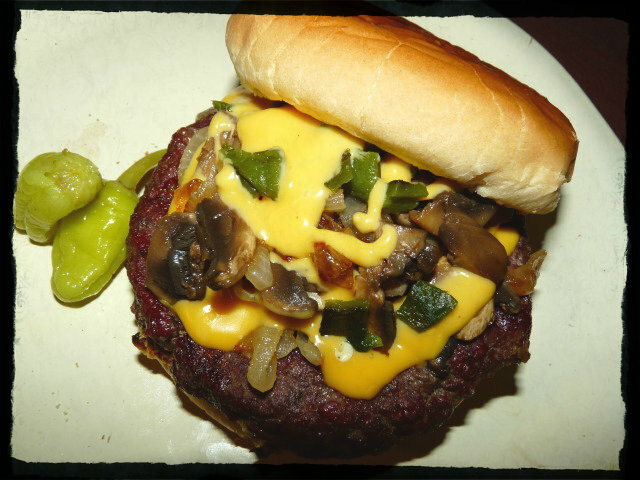 For my Texadelphia Burger, I also started with some ‘shrooms and onions, then topped it off with Cheez Whiz and some diced jalapenos that I roasted prior to cooking the burgers. Mrs. G’s burger sure did look good, and it must have tasted good considering the nice dent she put in it. Mine on the other hand…EPIC FAILURE!! That’s right…failure. Not often you see a blogger post a failure, but I’m human, I make mistakes, I flub cooks and this was one of them. I don’t know if it was the sweetness of the yellow onion or the NASTINESS of the Cheez Whiz. I’ve never bought Cheez Whiz, not sure if I’ve ever had it, but I never will again. That stuff is NASTINESS in a jar. I think if I ever try this again, I will use provolone cheese or something else. One interesting thing about this cook. If you look closely at the burgers, especially the last picture, you will notice a red tint to them. I wasn’t thinking about it, but the egg still had some cherry wood chips from the ribs we had previously smoked. 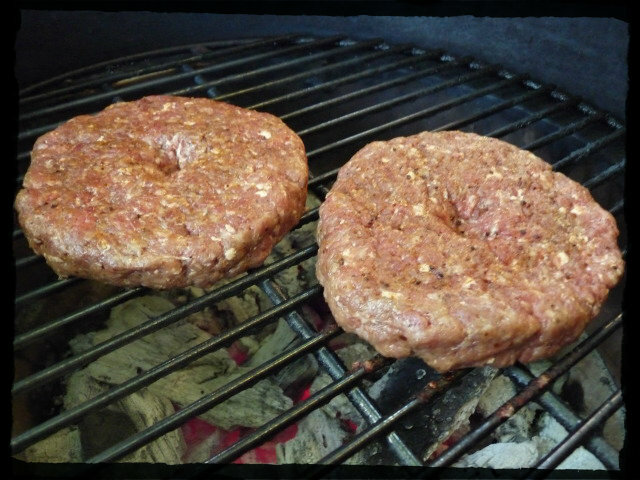 Those wood chips imparted a red tint to the burgers. Pretty cool, huh? We hope everybody had a safe, relaxing and fun Memorial Day Weekend, but more importantly that you took some time to think about and honor those that have died while serving and protecting our great nation. I am so, so sorry that the Texadelphia burger was a failure! I guess it’s not surprising considering the fake cheese on there. I agree; next time just the real stuff. It looks gorgeous. Your wife’s looks amazing as well. 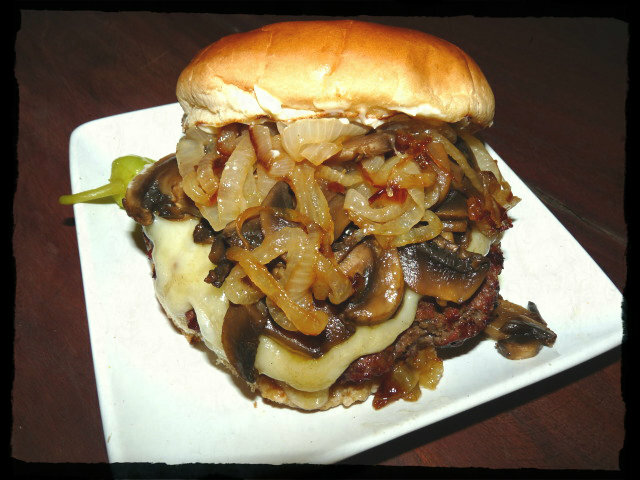 I love the stack of mushrooms and onions on it. You live and you learn, I suppose. Forgot to mention that Mrs. G took those pictures. I’m thinking she is a much better photographer and I’ve been handing the camera over to her more and more lately. Whoa! The Texadelphia Burger is a resounding success, in my opinion, if for no other reason than its authenticity. I’m talking about the Cheez Wiz, of course, which is used at Pat’s. The rest looks divine too. I’d be curious how a roasted poblano would taste in that, along with some good (mild) Mexican melting cheese. Boo about your burger. But, it sure looked good! You should have e-mailed before you headed to the lake! Guess where I live??? Don’t tell me…Whitney? Or somewhere close by? I think you’ve told me before, but I forgetted. Lake Whitney. I’m a few minutes from the dam. No kidding! We actually went over to the dam. Weather was pretty nice this weekend. The breeze coming off the lake made it nice at night. Might have been the last weekend that camping will be bearable in Texas till fall. One of my good old friends is from Whitney…Nice place. Remote, but nice…So, Jason, cherry wood actually makes the meat red??? That’s pretty cool….And ditto on the cheeze whiz. I just did a philly cheesesteak, and I cannot, not even for the sake of authenticity, use cheeze whiz. Provolone for me! Yeah, gives it a red color. Makes for a great looking turkey or chicken. Look up my Beer Can Turkey….if I remember correctly I used a cherry wood. Is the Texadelphia burger a tribute to the chain of restaurants in Austin? Ya know…I hadn’t thought of that. We have Texadelphias in Dallas as well and I like their cheese steaks, but no, I was just trying to use some of the stuff from a Philly Cheese Steak and put it in a burger. 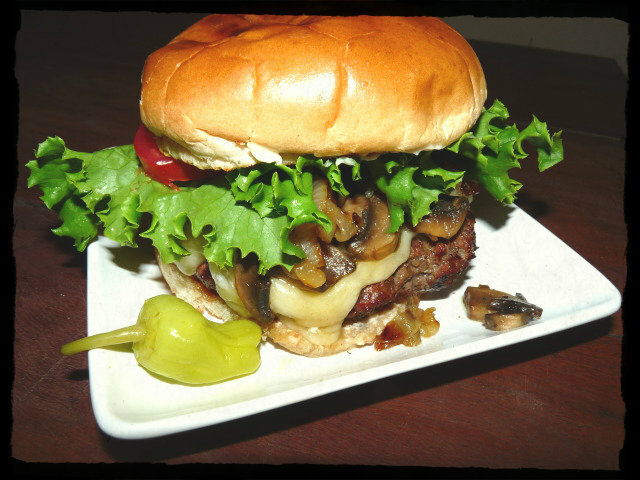 Yummmmmm… even though you say your burger was a fail I think I looks amazing…and would gladly take that on my plate any day… cheese whiz and all! Thanks for taking the time to visit my site. I’ll make you a deal….I’ll trade you one burger for one steak with bleu-cheese. How does that sound? Well, just the same, it was a great name for a burger, lol. Yeah, I like your idea about the provolone instead of Whiz.